The Phantom Keystroker may look like a harmless usb thumb drive, but it’s actually a devious contraption of unlimited office-based torture. 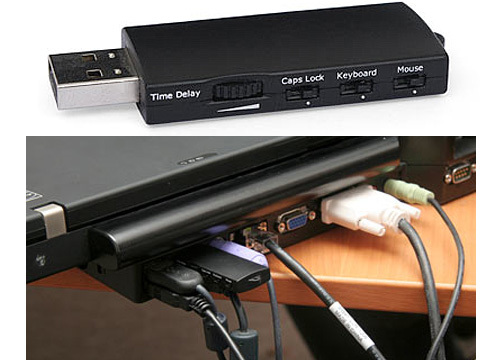 Simply discreetly attach the Phantom Keystroker to any extra USB port on your victim’s computer, no drivers needed. The Keystroker emulates a keyboard and mouse and periodically makes random mouse movements, toggles caps-lock and types out odd garbage text and phrases. Switches on the side allow you to choose between keyboard garbage typing, caps lock-toggle, annoying mouse movements or all three. Spot it without knowing what exactly it looks like..
And coming to the price,it costs just under $10..to be precise $9.9.